Beethoven’s Ninth. Social utopia or not – whoever tackles the topics of joy, freedom and brotherhood must be well on the way to being a citizen of the world. Recording engineer and producer Andreas Spreer has tackled this grandiose music and proved for all time that his Tacet label has advanced from being a small specialist recording company to a global player. 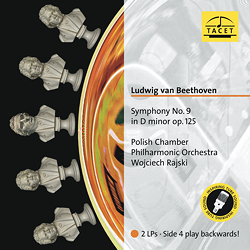 The Polish Chamber Philharmonic Orchestra and its inspiring conductor Wojciech Rajski fit ideally into this phase of growth and achievement, since Rajski committed ten years of his life to Beethoven’s symphonic legacy, which is now crowned with his present recording of the Ninth Symphony. The recording team dedicated themselves to the ambitious task of committing orchestra and chamber choir to tape and placed the musicians tactically and adventurously in front of highly sensitive, very exclusive microphones. Side 4 is playing backwards!